So What Is a Ouija Board Anyway? Ouija boards have been around since the 1880’s. Spiritualists in Northern Ohio were fascinated by a thing called the talking board, or alphabet board. This was supposed to be an easy way of communicating with spirits of the deceased. The Ouija board has its roots in automatic writing which dates back to 1100 AD China. The Ouija board was a homemade invention. This was DIY spiritualism at its finest! It’s first commercial introduction was in 1890, by Elijah Bond, a businessman. The board consisted of letters of the alphabet and numbers 0 through 9. The was also a “yes”, “no”, and “goodbye”, along with other symbolism. The planchette, is placed on the board and supposedly moved around by spiritual forces to give you your answers. Planchette is French for “little plank”. It was a small, triangular shaped board, usually set with small ball bearings to allow easy movement around the board. The Ouija board really took off at the end of the 19th century. People became really fascinated with it. This was marketing success at its finest! Norman Rockwell featured a painting of it on the cover of “The Saturday Evening Post”, back in May of 1920. that in itself probably didn’t hurt sales any. William Fuld, of Baltimore, took over the production of the Ouija Board in 1901. The William Fuld name is found on several of the earlier versions of the board right up until recent times. In 1966, the original family from Baltimore, Maryland, who developed it commercially sold the company to Parker Brothers, which was then sold to Hasbro in 1991. 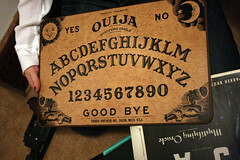 Right after being sold to Parker Brothers, the Ouija board outsold Monopoly in 1967! Wow! Many people are scared of the Ouija board. Some tend to associate them with demonic spirits and possession. No one really knows how the name “Ouija” came about. It is as mysterious as the board itself. Some say it was derived from the French and German words for yes. Sounds plausible-but who really knows? Brisk sales continued through the 1970’s, as an occult resurgence swept America. I know I bought one back in early 1973. I remember my step sister and I decided to play around with it. A typical teenage girl, my step sister decided that she would call out, “Oh, evil spirits!” Then wouldn’t you know it, the damned lights went out right at that moment! Scared us almost to death! No one else was home at the time, so I know my older brother wasn’t playing a prank on us. I told her she could have the board. I didn’t want this Ouija board anymore! I would love to find one again and hang it on my wall. They have stunning graphics, and would make a neat Halloween decoration! I would probably leave it up all year long with some of my other Halloween decorations. Why not? I think I will start searching for one now! Ouija boards can be down right creepy! Whether or not they are an instrument of the devil, I don’t know. There have been some scaring stories involving them none the less. Britney-I agree with you. I know the experience I had with one when I was a teenager, scared the crap out of me! I would like to have a good board to hang on my wall as a decoration though. Many thanks for providing this great info about Ouija boards! I have always found them to be quite fascinating myself, Helene. My grandmother used to tell us kids creepy stories about Ouija boards. She said a friend of hers actually channeled the spirit of a witch from the 1800’s. Scary stuff! I haven’t played with one myself, and probably won’t after hearing grandma’s scary stories. I probably won’t mess with one again either, Amanda, after what went on with me and my stepsister! Shivers!